Unfortunately, the dress you are looking for (Style: AL-60091, Name: AL-60091) is no longer available. Here's a long prom dress with a truly unique art-deco style that is sure to impress at your formal event. Asymmetrical ruching on the bodice presents a vintage look that continues through the tiered design of the long gleaming a-line skirt. 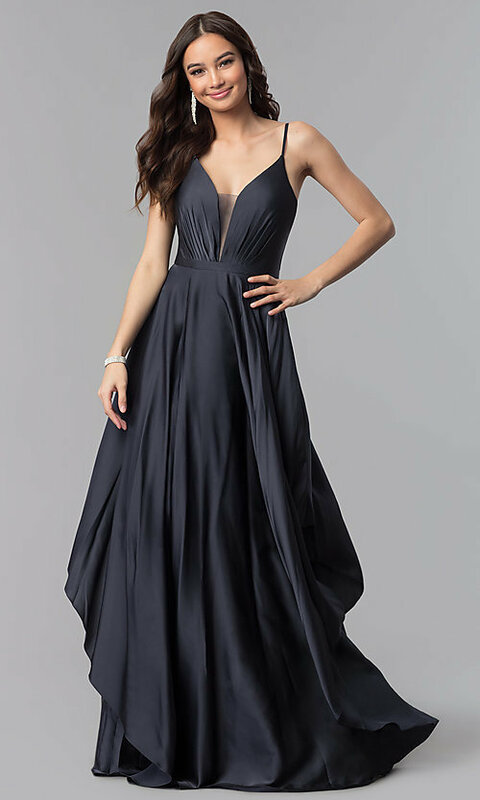 The beautiful evening dress, from the designers at Alyce, has an illusion inset that adds stability to the sultry deep v-neckline while spaghetti straps drape over the shoulders and transition to a deep v-back. A refined option for a winter formal or military ball, this long prom dress is overflowing with style for your special occasion celebration. The model wearing black cherry is 5'6.5" and wearing 6" heels.